There is many of us who are aficionados of cinematic story telling that mourn for the loss of movies and television that we can empathize with. The basis for all good filmmaking is the ability to connect with an audience, that in many ways has been lost as a result of Hollywood trying to have its product accepted globally. A dilution has taken place and the connective tissue between the American movie and the American audience has become strained and tired. The warm winds of the 1980’s blew into out viewing culture when the first Stranger Things began screening on Netflix. 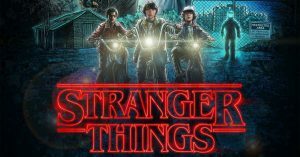 The Duffer Brothers, creators of Stranger Things wove the touchstones of great 80’s cinema into the series, more than aware of the longing audiences had for a style and substantive form of movie going that spoke to the common man. It is almost impossible to truly seek catharsis of a kind in the over blown comic characters than grace the screen. In Stranger Things 1 and 2 you saw the arising of characters and plot that spoke directly to the audience. It spoke, celebrating the past and celebrating the innovation of American cinema. An associative relationship has been established with the American viewing public and comes at a time when the political landscape and business landscape become increasingly cartoonish in its manifestations. For 9 episodes we could look back on this form of storytelling and fully realize what is missing from the current American cinematic landscape, stories about real people facing amazing situations. For too long we as a collective audience have had to deal with a product diluted for a global audience, a product that in no way the viewer could associate with….Hollywood imposed an embargo of empathy on the product it has been producing and in doing so has diminished it’s market. I will not discuss the series nor drill down on its many merits. I will ask that you look at the series with a fresh eye and look back at what made American movies great, look back and them demand more storytelling that truly celebrates the odyssey of the American working and middle class experience. As the old adage states, if you have forgotten where you have been you sure the hell ain’t gonna know where you’re going.